Bloom, Harold. 1999. Emily Dickinson. Broomall, PA: Chelsea House Publishers. আইএসবিএন ০-৭৯১০-৫১০৬-৪. Buckingham, Willis J. (ed). 1989. Emily Dickinson's Reception in the 1890s: A Documentary History. Pittsburgh: University of Pittsburgh Press. আইএসবিএন ০-৮২২৯-৩৬০৪-৬. Crumbley, Paul. 1997. Inflections of the Pen: Dash and Voice in Emily Dickinson. Lexington: The University Press of Kentucky. আইএসবিএন ০-৮১৩১-১৯৮৮-X. Farr, Judith (ed). 1996. Emily Dickinson: A Collection of Critical Essays. Prentice Hall International Paperback Editions. আইএসবিএন ৯৭৮-০-১৩-০৩৩৫২৪-১. Farr, Judith. 2005. The Gardens of Emily Dickinson. Cambridge, Massachusetts & London, England: Harvard University Press. আইএসবিএন ৯৭৮-০-৬৭৪-০১৮২৯-৭. Franklin, R. W. 1998. 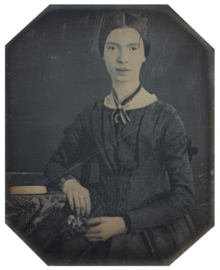 The Master Letters of Emily Dickinson. University of Massachusetts Press. আইএসবিএন ১-৫৫৮৪৯-১৫৫-৪.